The harn is an organ that serves as the centre o the nervous seestem in aw vertebrate an maist invertebrate ainimals. Anly a few invertebrates sic as sponges, jellyfish, adult sea squirts an starnfish dinna hae a harn; diffuise or localised nerve nets are present insteid. The harn is locatit in the heid, uisually close tae the primary sensory organs for sic senses as veesion, hearin, balance, taste, an smell. The harn is the maist complex organ in a vertebrate's bouk. 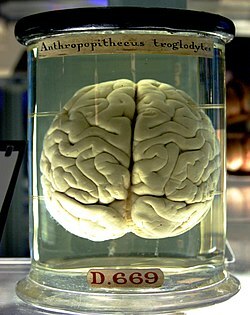 In a teepical bouk, the cerebral cortex (the lairgest pairt) is estimatit tae conteen 15–33 billion neurons, each connectit bi synapses tae several thoosand ither neurons. Thir neurons communicate wi ane anither bi means o lang protoplasmic fibers cried axons, which cairy trains o signal pulses cried action potentials tae distant pairts o the harn or bouk targetin speceefic recipient cells. Pheesiologically, the function o the harn is tae exert centralised control ower the ither organs o the bouk. The harn acts on the rest o the bouk baith bi generatin patterns o muscle activity an bi drivin the secretion o chemicals cried hormones. This centralised control allaes rapid an coordinatit responses tae cheenges in the environs. Some basic teeps o responsiveness sic as reflexes can be mediatit bi the spinal cord or peripheral ganglia, but sophisticatit purposefu control o behaviour based on complex sensory input requires the information integratin capabilities o a centralised harn. The operations o individual harn cells are nou unnerstuid in considerable detail but the wey thay cooperate in ensembles o millions is yet tae be solved. Recent models in modren neuroscience treat the harn as a biological computer, very different in mechanism frae an electronic computer, but seemilar in the sense that it acquires information frae the surroondin warld, stores it, an processes it in a variety o ways, analogous tae the central processin unit (CPU) in a computer. ↑ Pelvig, DP; Pakkenberg, H; Stark, AK; Pakkenberg, B (2008). "Neocortical glial cell numbers in human brains". Neurobiology of Aging. 29 (11): 1754–1762. doi:10.1016/j.neurobiolaging.2007.04.013. PMID 17544173. ↑ Yuste, Rafael; Church, George M. (March 2014). "The new century of the brain" (PDF). Scientific American. 310 (3): 38–45. Bibcode:2014SciAm.310c..38Y. doi:10.1038/scientificamerican0314-38. PMID 24660326.